How “Texan” is the UT Tower? The Tower. It’s the signature, iconic symbol of the University of Texas. Bathed in warm orange lights to announce academic honors and sports victories, crowned in fireworks for spring commencement, it’s been a backdrop for freshman convocations, football rallies, concerts, and demonstrations. Architect Paul Cret intended the Tower to be the “image carried in our memory when we think of the place,” though author J. Frank Dobie, incensed that a state so rich in land would build something better suited to New York City, branded it a “toothpick in a pie.” While a college is sometimes described as being housed in a metaphorical “ivory tower,” the University of Texas doesn’t settle for expressive substitutes. We have a tower all our own. What will surprise many is that the Main Building and its 27-story Tower, now so identified with Texas, is actually a blend of many sources, most of them not from the Lone Star State. And the proudest of Longhorns may cringe to learn that part of the inspiration for the building’s design came from, of all places, New Jersey. The building’s designer was Paul Cret (pronounced “Cray”). There’s a persistent campus myth that he attended Rice University in Houston (more on that here), but Cret was born in Lyon, France, graduated from the prestigious Ecole des Beaux-Arts in Paris, and immigrated to the United States. 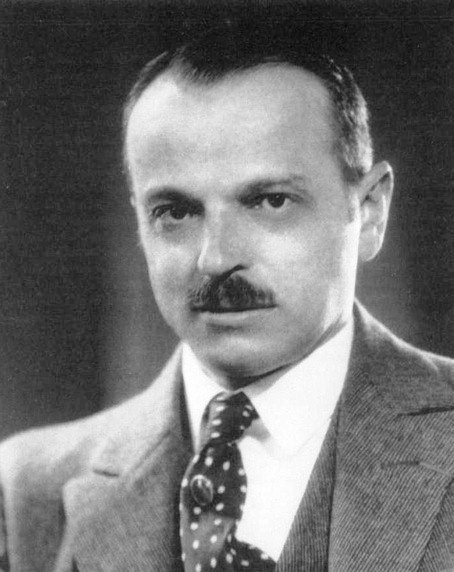 When he was hired to be the consulting architect for the University of Texas in 1930, Cret headed the architecture school at the University of Pennsylvania in Philadelphia and maintained an active private practice. His office was on Market Street downtown. Completed in 1937, the Main Building was both the University’s central library and focus of Cret’s campus master plan. As the monumental structure on the Forty Acres, the architect was careful in his choice of materials and talent. Some of this was recruited from Texas, but much of the building, both physically and conceptually, arrived from beyond the state’s borders. Visitors to the Main Building will likely recognize the Austin shell stone – locally quarried limestone packed with fossilized shells – used to frame the doorways in the building’s front loggia. Inside, the Magnolia Gray marble along the walls of the “grand stairway” was shipped from West Texas. And some of the bricks from the old Main Building, made in Austin, were recycled for the inner walls and air shafts of the new structure. Robert Leon White, a UT graduate and member of the architecture faculty, contributed to the design of the interior of the building, and served as supervising architect for its construction. Peter Mansbendel of Austin, an internationally-known master artisan in the first half of the 20th century, was responsible for most of the elaborate wood carving in oak and walnut. Aside from those few native sources, much of the rest of the building is from outside Texas. The walls of the Main Building and Tower were constructed of Bedford, Indiana limestone, known for its hardness and durability. The Mediterranean red-tiled roof, a defining characteristic of most UT buildings, was authentic, as the tiles were shipped from Spain. Marble used for the steps, floor, and benches in the loggia, the steps of the grand stairway, and even the water fountains, is from Tennessee. In the reading rooms, a variety of other marbles, from light grey to rose to charcoal, were imported from such faraway places as Missouri, New York, and Vermont. The ornate brass light fixtures found throughout the building were designed by Edwin Cole of Chicago. 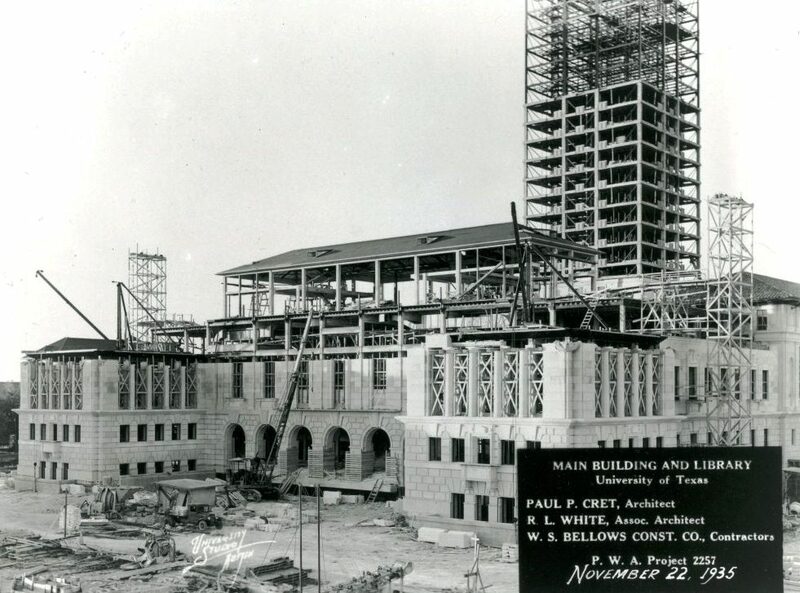 Above: Construction of the Main Building in 1935. The Tower’s book stacks were designed by Snead and Co. Ironworks from New Jersey. The Tower itself was initially intended to house the library’s book stacks, and Cret hired Snead and Co. Ironworks from Jersey City, New Jersey to design and construct them. The company was world-famous for its innovative approach to library shelving and published two books on the subject. Its clients included the Library of Congress, Harvard, Stanford, and Cornell Universities, along with the Vatican Library. Built of cast iron, the Tower’s infrastructure supported the 27-floors, four-faced clock, and belfry, as the Indiana limestone was wrapped around it. 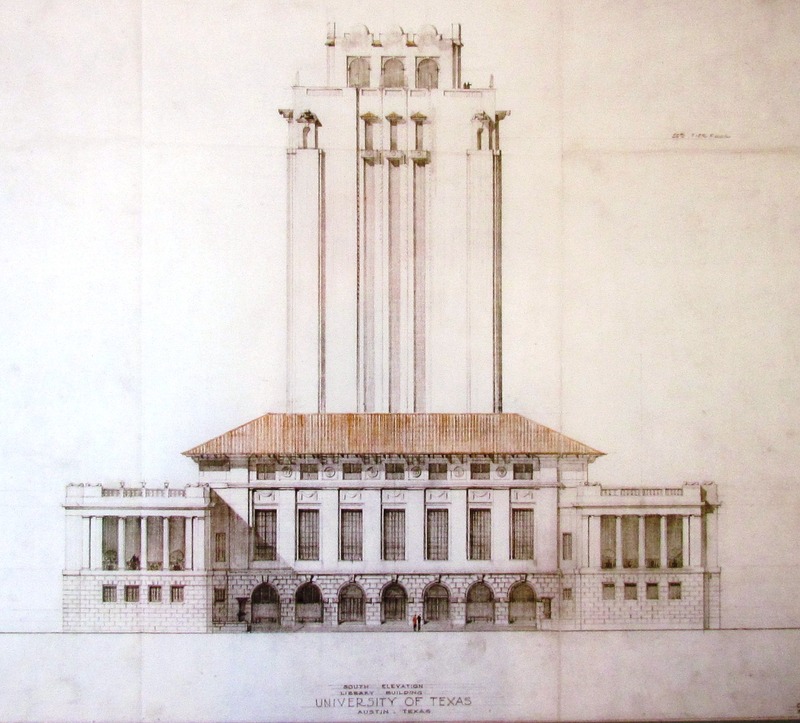 Above: One of several proposed versions UT’s Main Building and Tower. Copies are on display in the Tower’s observation deck. The originals are preserved in the Alexander Architecture Archive in Battle Hall. What of the Tower’s design? Cret sketched several possibilities, including a Tower that was a short, wide, solid mass (pictured). But the version most popular with the Board of Regents happened to be one that was, in part, inspired by the newly completed city hall building in Camden, New Jersey. That the appearance of the Main Building was influenced by other structures shouldn’t be a surprise. As with writers, artists, or musicians, it’s not unusual for architects to be inspired by ideas from colleagues or predecessors. The University’s first library building, created by Cass Gilbert and today known as Battle Hall, took its cue from the Boston Public Library. 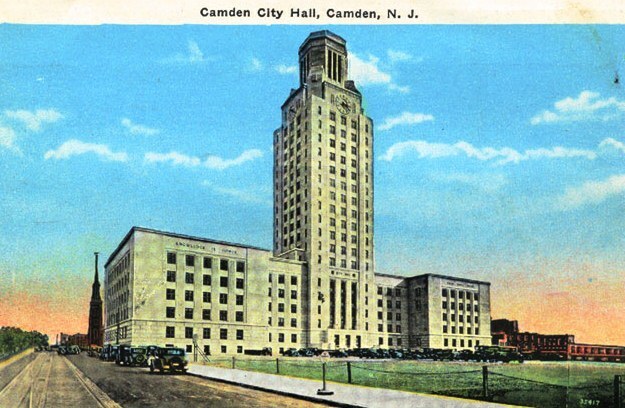 Camden, New Jersey sits directly across the Delaware River from Philadelphia, and the Camden City Hall building was constructed from 1928 – 1931, just as Paul Cret was hired by the University of Texas. The architects for Camden’s building, Alfred Green and Byron Edwards, learned their trade from the Beaux-Arts Institute of Design in Philadelphia, founded by graduates of the Ecole des Beaux-Arts to train American architects in the French method. Cret was both a patron and guest lecturer of the Institute, and interacted regularly with Green and Edwards throughout their careers. Made of light gray granite, the City Hall was (and still is) the dominant sight on the Camden skyline. 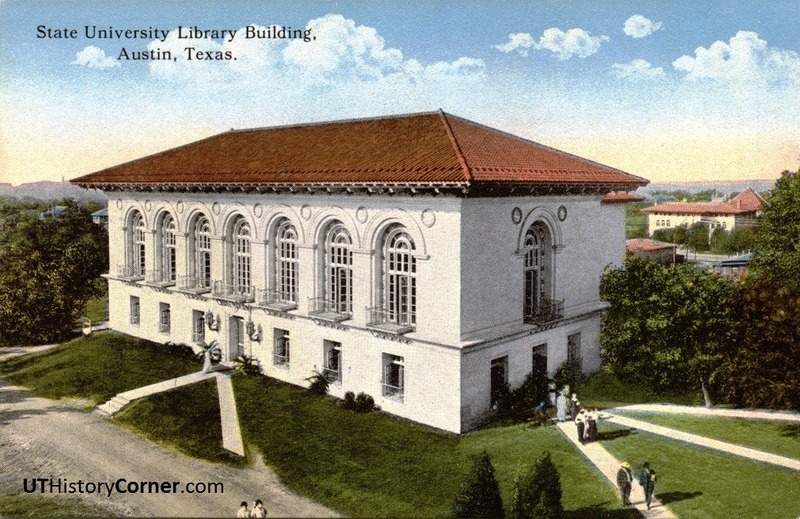 It was an object of great interest during its construction, and Cret was able to view its progress from his Market Street offices as he contemplated the plans of a new library in Austin. 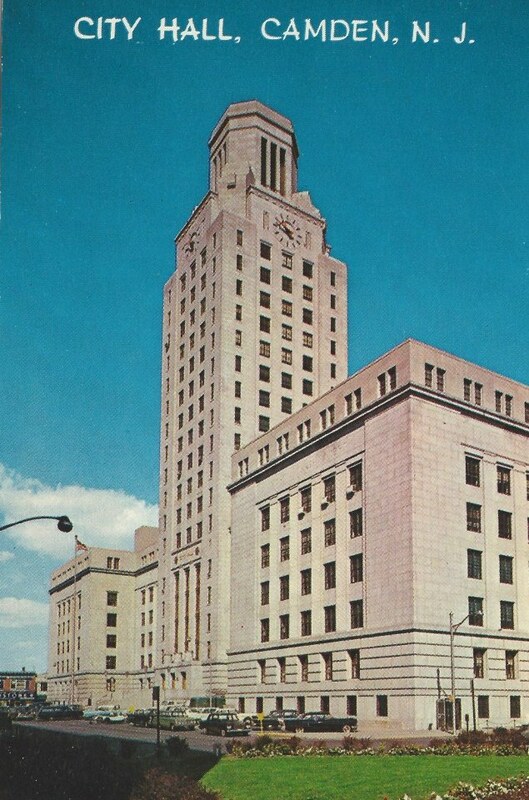 Above: A post card view of Camden’s City Hall. 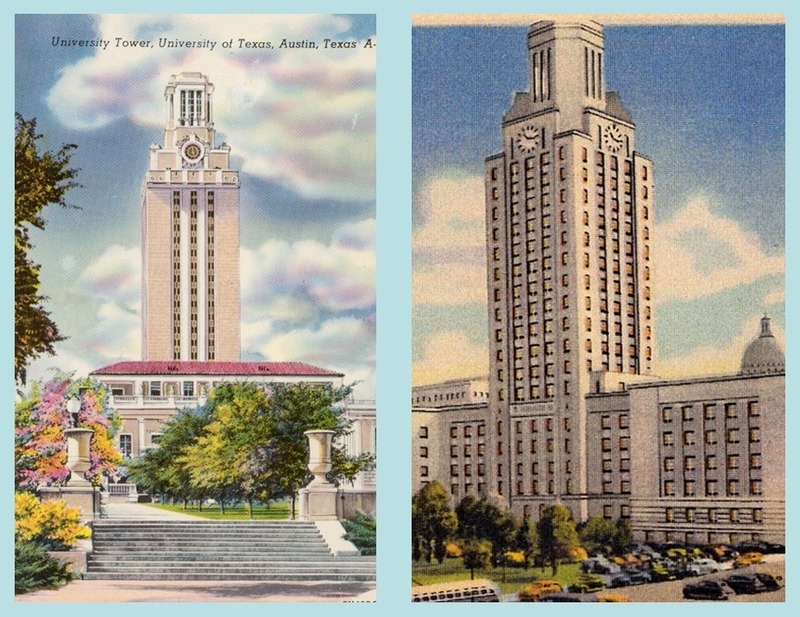 The physical similarities between it and the UT Tower are too numerous to dismiss. Along with the general shape of the tower, clock, and belfry, the massing of the lower part of the building – even the rustication of the first two floors – resemble the Main Building in Austin. This entry was posted in Uncategorized and tagged Camden, Cass, Cret, Gilbert, Jim Nicar, New Jersey, Paul, Tower by jimnicar. Bookmark the permalink. We thought you’d find this timely and funny at the same time. Tasha messaged me on Wednesday before you sent this telling me she saw a building in Philadelphia that looked just like the UT Tower. It took us until tonight to realize she was actually looking into NJ from the Philly freeway and was looking at the actual building.